1. Register to become a consignor. Click HERE to register as a consignor for our sale. (Click HERE for VIDEO TUTORIAL) Don't forget to read the GUIDELINES for all the details. Registration will be open from Friday, March 1st at 10 pm and will continue until Sunday, April 7th at midnight. There is a $10 participant registration fee that will be taken out of your proceeds check at the end of the sale. You must have at least 10 items to participate in our sale. Don't forget to sign up for a drop off shift and a work shift. 2. Gather all the items you want to sell. Look for almost anything that pertains to babies, kids and teens. We take gently used clothing, toys, games, baby accessories like strollers, high chairs, bedding, bouncy seats, etc., books, movies (no VHS - DVD only), puzzles, video games, sports equipment, bicycles, ride on toys, and more. We take sizes infant and newborn through teen sizes. We also take maternity, formal dresses, costumes and school uniforms. Click HERE for a listing of items we cannot accept. Please do not bring any item that has been recalled as it is illegal to sell recalled items. You can check for recalled items at wemakeitsafer.com. 3. Prepare your items. Wash and press clothes, wipe down toys and baby gear. Cleaner items in good condition are more likely to sell. Hang clothing on wire hangers and organize them by size and gender. Keep the hanging clothes grouped together using rubber bands. (Please do not zip tie hangers together.) Use zip ties to keep shoes together. Put working batteries in all battery operated items so you can show that they are in working condition. 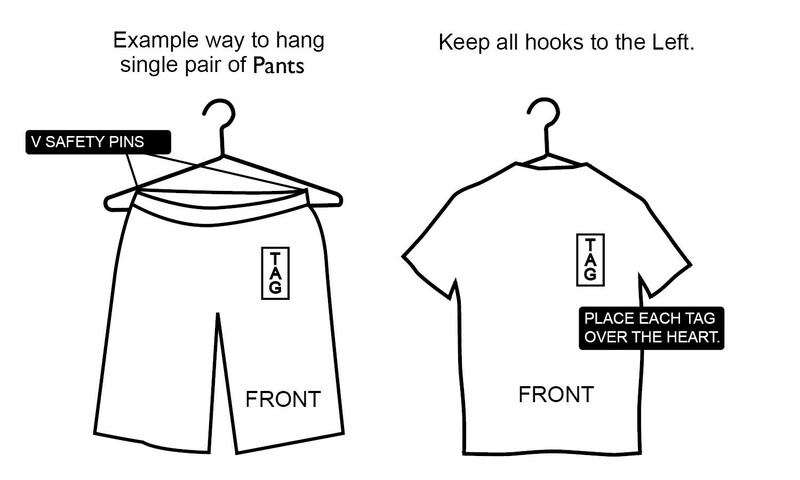 Click HERE to see the proper way to hang clothing on hangers. If you have Junior clothing, please write JRS or Juniors with the size in the top right corner of the index card. (Click HERE for VIDEO TUTORIAL for prepping hanging clothes) This is important so that shoppers can easily see your clothing you are trying to sell. 4. Price and tag all your items. Use our online bar code ordering system to order bar code labels in the prices you need. You decide the price and choose whether or not to discount it. If you do not want an item discounted on Saturday, the bar code must say NO DISCOUNT. Print the bar code labels on your home computer using Avery 5160 labels and put them on index cards with the description, price, size and your consignor number. Put a red dot beside the price of any item you do not want to sell for half price on Saturday. Pin the index card to clothing and tape or zip tie the index card to non-clothing items. 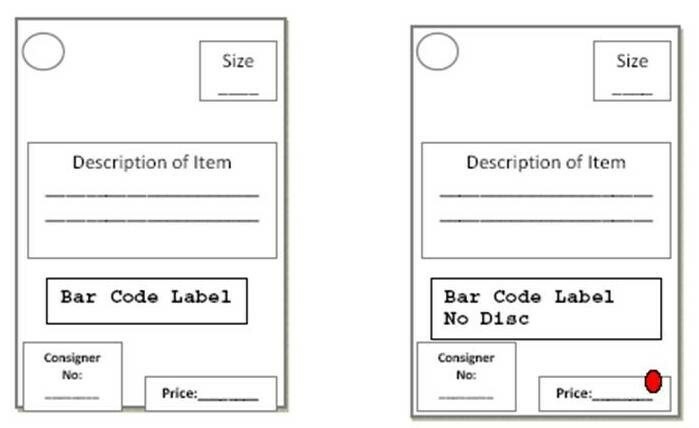 Click HERE to see an example of the bar coded index pricing card. Please keep in mind that items marked No Discount do not sell well on half-price Saturday. If you intend to donate your unsold items on Saturday, please allow all of them to be discounted on Saturday. 5. Drop off your items before the sale and pick up unsold items after the sale. Set up a drop off time HERE. Then bring in your items cleaned, hung, price tagged and ready to go at your chosen drop off time. We will check all items for compliance to our guidelines. Anything rejected will be returned to you with your unsold items on Saturday. We will sell your items to the public onThursday, Friday, and Saturday. Pickup unsold items on Saturday afternoon or have us donate them for you. Consignors 1-250 will pickup between 3:30-4 pm. Consignors 251 and up will pickup from 4 pm-4:30. All unclaimed items left after 4:30 pm will be donated. You will receive a check in the mail within 10-14 business days for your proceeds from the sale. It is important that you check your address in the system to make sure we have your correct address. 6. As a consignor, you will be allowed to shop the sale before it opens to the public on Thursday night. The consignor pre-sale takes place on Thursday before the sale from 5:30 pm to 9 pm. If you consign, but do not work a shift, you will receive 50% of your proceeds minus the $10 registration fee. If you would like a higher percentage, then all you have to do is work one 3 hour and 15 minute work shift and you will receive 70% of your proceeds minus the $10 registration fee. If you would like to sign up for a work shift, click HERE. We rely on our workers to make our sale run efficiently and we thank you for your hard work! If you are late for your shift or do not work your shift you signed up for, your percentage will be reduced to 50%.